While there is a rat race out there amongst designers and retail houses, more often than not we see the same prints and styles being piled on. It has become almost impossible to tell the difference between one brand and the other. Amidst this madness, we really appreciate when we come across a brand/designer who makes sure their clothes are an extension of themselves. For Eid we happened to check out Silk By Fawad Khan. 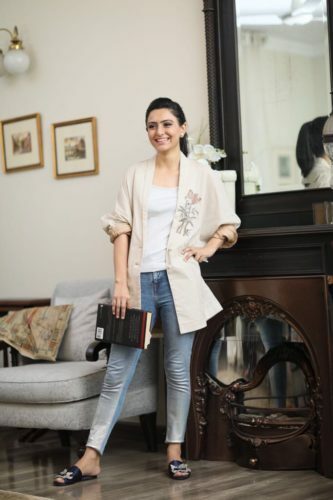 With Sadaf Fawad driving the brand and its aesthetic and doing a mighty fine job, we felt Silk definitely is filling a gap by introducing easy and fun silhouettes that are young, feminine and full of grace. Here are some designs we absolutely love, modelled by the beautiful Zarmisha Dar. This jacket is such a refreshing break from the print mania. with subtle embroidery and over size androgyny it makes for a very effective smart casual look that is Oh So graceful. For summer a powder blue top with a longer white slip, tastefully done lace and embroidery and white flared pants is just perfect. We love how the silhouette isn’t clinging to the body making it perfect for a lot of different body types. Try this on, you will love it. Pink is the most feminine color there is, and these double shaded pants and embroidered top will make for a great lunch outfit. The shorter front and the longer back also makes it easy to carry for different body types and adds height. It is a lovely piece perfect for any day. 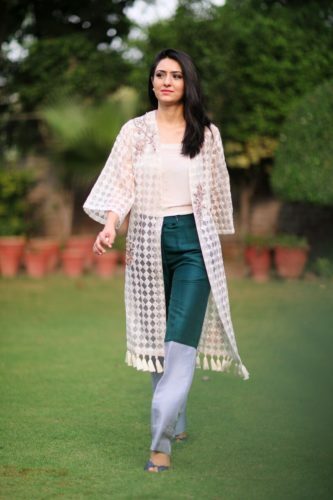 These two toned pants are bang on trend and coupled with a white long jacket its quite a statement. 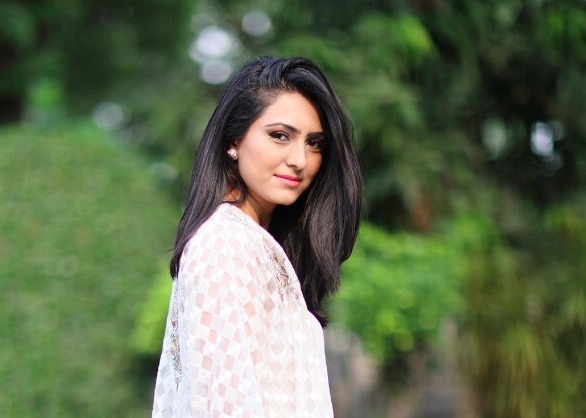 We love how Zarmisha carries the look, and with hair up and nice earrings you can wear this look from day to night.